On a new team for 2017, Philippe Gilbert reignites his love for the Flanders cobbled classics and heads to the Ronde as a favorite. ZOTTEGEM, Belgium (VN) — Philippe Gilbert is an endangered species in pro cycling. It is rare that a rider can win in both the cobbled classics and the Ardennes. Gilbert rode alone from the Quick-Step team bus in Zottegem Wednesday morning ahead of the second stage of Driedaagse De Panne-Koksijde. The Belgian champion, winner of stage 1 at the Flemish stage race, already counts all three Ardennes classics in his palmarès. 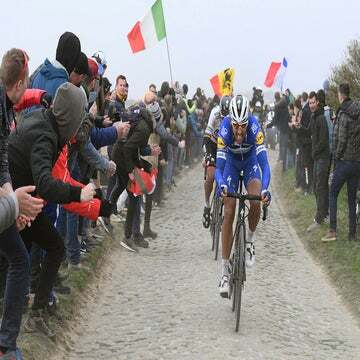 If he wins the biggest cobbled classic, the Tour of Flanders on Sunday, it would be quite rare. Italian Michele Bartoli last managed in the 1990s to win a cobbled monument (Tour of Flanders 1996) and the Ardennes monument, Liège-Bastogne-Liège in 1997. Around that same time, Rolf Sorensen won Liège in 1993 and Flanders in 1997. Ireland’s Sean Kelly did so as well, winning both Paris-Roubaix and Liège in 1984. Gilbert, 34, followed an odd path to reach this point. After placing third in Flanders twice, he focused strictly on the Ardennes classics. 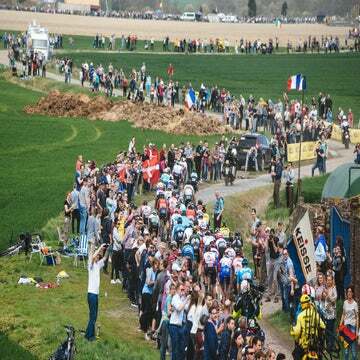 His peak shifted away from the cobbled classics, from late March through early April and to the Ardennes in the south, later in April. He last raced a full cobbled campaign in 2012. He won the Amstel Gold Race in 2010, 2011, and 2014, and all three Ardennes classics — Amstel, Flèche Wallonne, and Liège-Bastogne-Liège — in 2011. BMC Racing took him to the Ardennes classics instead of the cobbled ones because it had an improving Greg Van Avermaet who needed his space. After five years, Gilbert wanted to switch. Team boss Patrick Lefevere stood behind the team’s blue and white bus. He had just finished an interview with the local television broadcaster. Lefevere first scouted Gilbert and the country’s other top star Tom Boonen in their junior years. They were “unfortunately” in the same age bracket as his son when he raced as a 13- to 15-year-old so he would see them regularly in the weekend races. We may no longer see riders like Gilbert in cycling due to the changes the organizers are making to their courses. “It’s harder to do well in both because the Ardennes are becoming harder and more suited to the GC riders, 60kg riders like Alejandro Valverde, Julian Alaphilippe, Wout Poels …” Lefevere continued. Gilbert only has a contract through 2017, but Quick-Step could keep him on to replace Boonen as a mentor to its young riders.